Leads are important for businesses. Without leads certainly no business can ever thrive. They represent the potential customers which can be converted into your active customers. It is inclusive of all sales related inquiries or potential customers, which if properly targeted, can convert into customers who purchase services or goods from you. For a business to grow, it's imperative to actively and effectively manage leads. How RepairDesk helps in managing leads? Having potential customers, it is important that a business keeps track of its leads. RepairDesk understands your needs and therefore has crafted a whole Manage Leads section in the app. 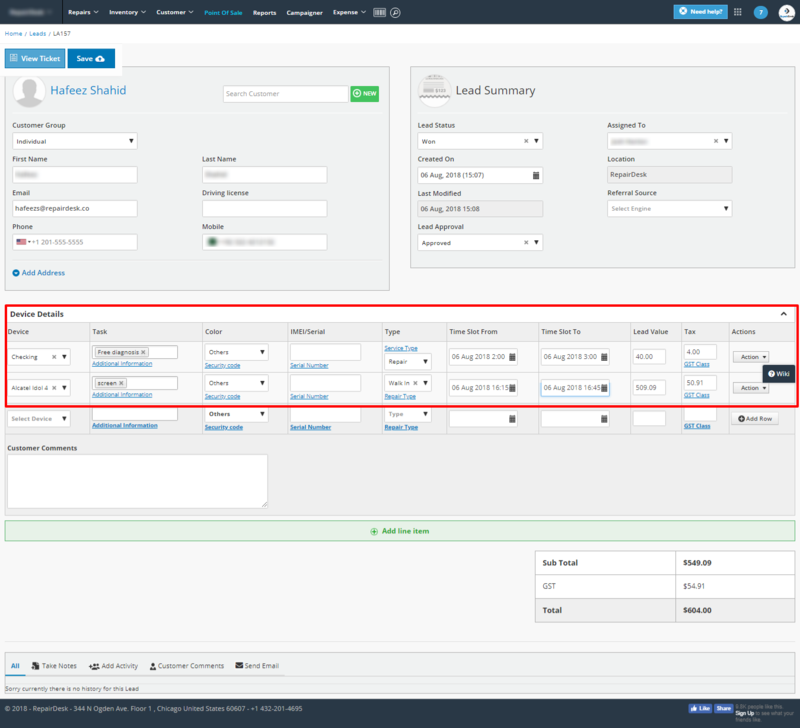 With RepairDesk's Lead Management module you can keep track of incoming leads, view referral channels through which they come, monitor their status, see the value of leads or contact them. In RepairDesk you can create leads either manually or receive them through our Appointment Calendar Widget. You can view the complete list of your leads by going to Repairs tab on RepairDesk and selecting Manage Leads section. You can easily change the status of a lead by clicking on Status of a lead and updating it by selecting an option from the drop-down menu. The dashboard on Manage Leads section provides you with a overall review of incoming inquiries. Leads Graph allows you to view the status of all lead inquiries. From a glance it would be visible to you how many leads have been successfully converted, how many are lost and the number of inquiries which are still in progress. 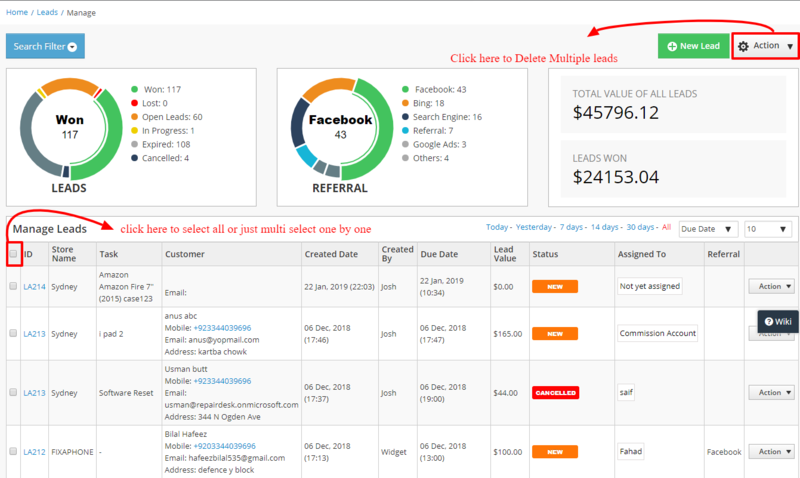 Referral Chart helps you in identifying the number of leads coming from a particular channel. This will help you in concentrating your marketing efforts on the referral channels which are producing the most lead inquiries. Statssuch as Total Value of All Leads and Leads Won will provide you the monetary value of total lead inquiries and the revenue which was added to your business by those leads which were incorporated in your customer base respectively. Searching leads can be like finding a needle in a haystack. To spare you from this painful and rather tedious task, we've introduced search filters through which you can easily filter leads according to selection criteria. Note: Please ensure that lead IDs are different for different stores for an effective search. For Example if you have a lead A-098 in Store A ,then a lead in Store B should be B-098 to remove confusion. If you want to download the list of all leads, you can surely do so by clicking on CSV button and click on Export. A CSV file comprising of of all leads would be downloaded on your system. Lead can be added in RepairDesk via Appointment Calendar Widget, which come automatically through the widget. However you can manually add a lead via RepairDesk. To add a lead, click on Add New Lead button to add a new lead. When you will click on Add New Lead button on the Manage Leads page, you will be redirected to the Create New Lead page. Click on the Add Address link to expand the Customer Information area and add address and contact details of the Lead. You can add the device detail which needs to be repaired. here you can add IMEI/ serial, color, and task type that either customer will walk in or will he mail the device to get repair. if you have multiple devices and want to generate a single lead for both devices you can use RD lead module. Finally, click on the Save button to save a lead. You can edit or delete an existing lead by clicking on the Action button against each lead. Select Edit to update a lead and Delete to remove it from the list. the user can also multi-select lead and through Action button delete those leads. You can make an estimate of lead for the customer or transfer lead from one store location to another. You can also close a lead by converting it into a ticket. Track a lead by taking notes, scheduling follow up activities and send emails. Take Notes - You can add notes against a lead. You can assign these notes to your employees as well. Sometimes when a customer is booking an appointment he may select another store than the one he intended to book a repair into. Therefore we have introduced a functionality which will allow you to transfer leads between a store. The process is super easy. Let us show you how. Suppose, a customer selects Store-B instead of store A. Now if you are logged into Store-A you will not be able to see this lead as it was booked under Store-B. To find a lead in all store locations, open the search filter and enable trigger "search on all stores". Now you will be able to see this lead. Click on Action button to transfer the lead to current store. You can also transfer a lead at a later stage by opening a lead and clicking on Transfer Lead button. A pop up screen will open from where you can select the location to transfer a lead as well as assigning it to an employee. You can also write staff comments for further clarification. Once finished, click on Save to complete lead transfer. Q. I want potential customers to book repairs on my website and I want these appointments to be incorporated as leads in RepairDesk. Is it possible? A. Of course! RepairDesk offers an awesome tool for this purpose: the Appointment Calendar Widget. The widget, once enabled on your website, will allow potential customers to book repair appointments with you. Once a customer books an appointment, through the widget, it will appear as a lead in RepairDesk. To know more about how the appointment calendar widget, please check this article. Q. What is an activity? A. An activity allows you to schedule follow up activities such as call, email or field visit. This allows you to keep track of your engagements with the lead in question. When you open a lead, you can add activity against it by clicking on the Add Activity tab at the bottom. Write subject, date & time, content and assign it to any of your employees so that they can follow up on a lead. Finally, hit save to add activity. Q. How can you add notes against a lead? A. You can add notes against a lead or assign them to one of your employees. 1. Just open a lead and at the bottom, click on Take Notes tab. 2. Assign it to yourself or an employee. 3. Select how you want to communicate this note (you can do so via Comments, Email or Telephone Message). 4. Click on Save or Send depending upon the selection you have made above. Q. How can you send an email or SMS alert? A. Send an SMS or Email to your lead by clicking on the Send Email tab at the bottom. 2. Choose whether you want to send an SMS or Email. 3. Write the subject line and content. And presto! you've sent an email/ SMS alert to your lead. Q. How can I get an alert about a lead in RepairDesk? A. Once a lead is generated via Appointment Calendar Widget, you'll receive a pop up notification with sound on RepairDesk. Also, you would be able to view this in notifications by clicking on the bell icon at the top. Once a lead arrives, the selected employees would see the pop up notification announcing the arrival of a new lead. Click on view lead to see more details about the lead. Q. How to assign a lead? Q. How to convert leads into sales? A. To convert a lead into a sale you can change the status of the lead to "Convert to ticket". A ticket will be generated in the system and you can make an invoice from the ticket. Q. How can I track Delivery email, SMS sent to employees and customer? A. Yes, Delivery of email and SMS can be tracked through admin history. All Auto Generated and Manual email and SMS can be tracked through Admin history with their date, time and delivery status.